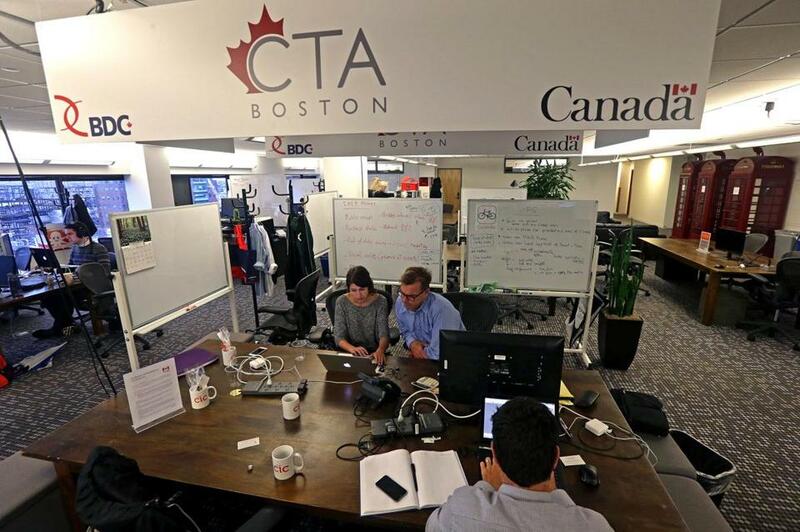 Canadian startups have a presence at the Cambridge Innovation Center. This story was produced by Stat, a national publication from Boston Globe Media Partners that will launch online this fall with coverage of health, medicine, and life sciences. Learn more and sign up for Stat's morning newsletter at Statnews.com. Sitting in a Kendall Square conference room one day this summer, Canadian entrepreneur Tyler Wish found himself grasping for a crisp way to describe what his company, Sequence Bio, offers. People can’t wrap their heads around genomic data analytics, Wish said, as easily as they understand a resource like oil or fish. “It’s a little bit intangible, right?” said Wish, who is from Newfoundland and Labrador. His business coach, paid for by the Canadian consulate, nodded in understanding. For help developing his company, Wish had turned to an accelerator program, run by the consulate, that brings startups from across Canada to the Boston area for months at a time. The program is one of an increasing number of initiatives by foreign consulates to help their countrymen capture — and replicate — some of the area’s startup magic. Consulates, of course, aren’t just discovering the business opportunities that exist in science and technology in the Boston area. Swissnex Boston, as the Swiss refer to their “scientific consulate” in Cambridge, is celebrating its 15th anniversary, and the British consulate general has been based in Kendall Square for more than a decade — and is now in the building where the Cambridge Innovation Center is located. “We know everybody, because everybody’s our neighbor,” said Kirsten Chambers-Taylor, head of trade and investment for the British consulate. But as the innovation economy has taken off in recent years, an increasing number of countries are trying to tap into the Boston area’s biotech prestige, diplomats say. Consulates offer assistance ranging from market research, to connecting startups with investors, to sponsoring entrepreneurs who relocate in the area temporarily. They arrange meetings between local officials and foreign institutions and industries and build partnerships with universities and accelerator programs. They also recruit expatriates to serve as mentors for entrepreneurs. In fact, some local consulates eschew more traditional diplomatic work like visa assistance to focus on economic development, loading their staff with attaches specializing in technology and science. To share best practices among regional consulates, Felix Moesner, the Swiss consul, last year founded the Science and Technology Diplomatic Circle Boston. The organization has members from more than 50 countries, including Nicaragua, Pakistan, and Cambodia. They’ve toured places such as the Dana-Farber Cancer Institute and MIT’s World Wide Web Consortium to gain a sense of possible partnerships for companies or institutions back home. Mexico is working to start an accelerator of its own soon. And next month, officials from the United States, Mexico, and Canada will meet in Kendall Square to discuss how accelerators can help companies go global. On a recent morning at the Cambridge Innovation Center, four mentors peppered Canadian entrepreneur Francis Davidson with questions about his company, Flatbook. The Canadian Technology Accelerator program rents offices at the center for its “resident” companies. 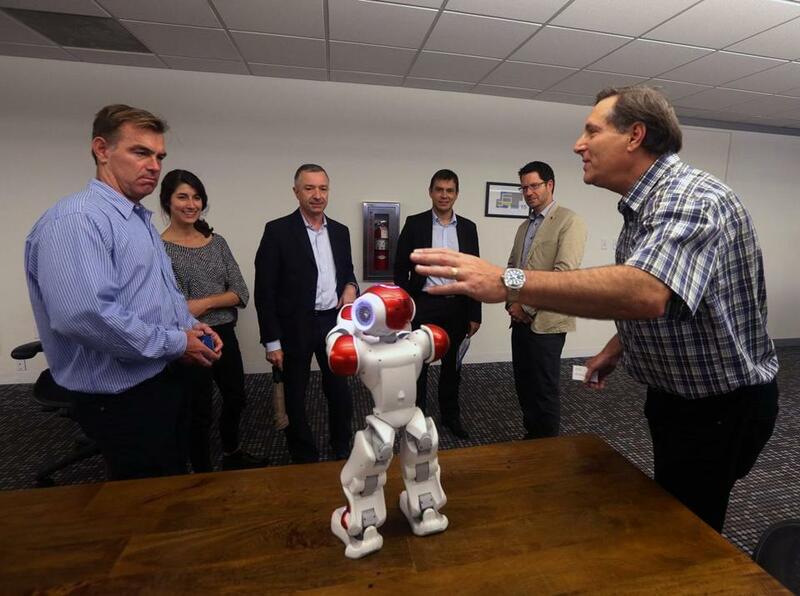 Mark Williams (far right), president and CEO of Canadian startup RxRobots, spoke during a meeting at the Cambridge Innovation Center. Davidson, who had just arrived via overnight bus from Montreal, described how Flatbook spruces up Airbnb rentals with a hotel-quality bed and other amenities. The mentors quizzed Davidson about how the company cleans the rental units, how it plans to expand, and how it attracts clients who were accustomed to hotels. “Is it price that you think pulls people into your world, or is it experience?” asked Nevin Markwart, a financial executive and former Boston Bruin. It’s both, said Davidson, chalking it up to the value that Flatbook provides. Another skill consulates try to impart: how to do business in the United States, including pitching American investors. Linda Plano, the pitch coach who works with the Canadian accelerator, said she tries to get Canadian entrepreneurs to hype their accomplishments and feel more comfortable making a big request from investors. “Not to overly generalize, but they tend to be less aggressive than the US entrepreneur,” said Plano, who runs the consulting firm Plano & Simple. Tyler Wish, of Sequence Bio, said spending a few months in the United States “helped us to think much larger” about what the company could do. He met with executives at large pharmaceutical companies, thanks to connections from the Canadian consulate, and his firm recently announced it had raised $1 million in seed funding. Sequence Bio’s time in the accelerator wrapped up in August, but Wish was back in the Boston area last month for meetings with advisers. It’s a trip he will probably be making more frequently: The Boston network has been so fruitful that Sequence Bio is looking to rent office space in the area. Follow him on Twitter @DrewQJoseph. Follow STAT on Twitter @statnews.